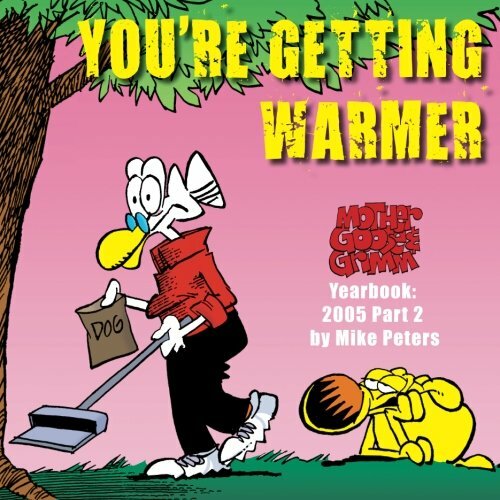 This book, You're Getting Warmer, published by Grimmy, Inc., is a collection of Mother Goose and Grimm cartoons from 2005 created by Pulitzer prize winning cartoonist Mike Peters. Mike Peters has been interested in cartooning since childhood. Born in St. Louis, MO on October 9, 1943, he graduated from Christian Brothers College High School in 1961. In 1965, he received a Bachelor of Fine Arts degree from Washington University and immediately began his career on the art staff of the Chicago Daily News. The following year he began two years of service with the U.S. Army as an artist for the Seventh Psychological Operations Group in Okinawa. After Vietnam, the renowned W.W. II artist Bill Mauldin mentored Peters and helped him find a cartooning position on the Dayton Daily News in 1969. In 1972, his editorial cartoons became syndicated nationally. In 1981, Mike was awarded a Pulitzer Prize for Journalism, and in 1984, Peters created the award-winning Mother Goose & Grimm comic strip. Mother Goose & Grimm appears in more than 500 newspapers worldwide and consistently places in the top 10 most popular ratings. Peters' has 28 Mother Goose & Grimm books in print. Licensees distribute Grimmy products all over the world. "Grimmy," the weekly Saturday morning animated series launched in September 1991 on CBS, continues to air in several countries. In July 1999, Mother Goose & Grimm became an attraction in the new Toon Lagoon theme park at Universal Studios. Peters' work is syndicated in newspapers worldwide and frequently appears in national publications and on national television. He is a frequent guest on television programs, such as Good Morning America ,The Today Show , MSNBC, CNNFN and C-SPAN. Peters is also a popular lecturer and makes appearances at editor and publisher conventions, on the college lecture circuit and before political groups. Peters is a member of the National Cartoonists Society, and is also on the Board of Advocates of the Planned Parenthood Federation of America and an Honorary Member of the American Association of Therapeutic Humor based in St. Louis, MO. Peters is a member of the Defense Orientation Conference Association, a civilian group formed by the Defense Department which is dedicated to the understanding and studying of national security on an unclassified basis at all levels. Mike Peters quote "I try to have fun when I draw, if you have fun drawing a cartoon, people will have fun looking at it."